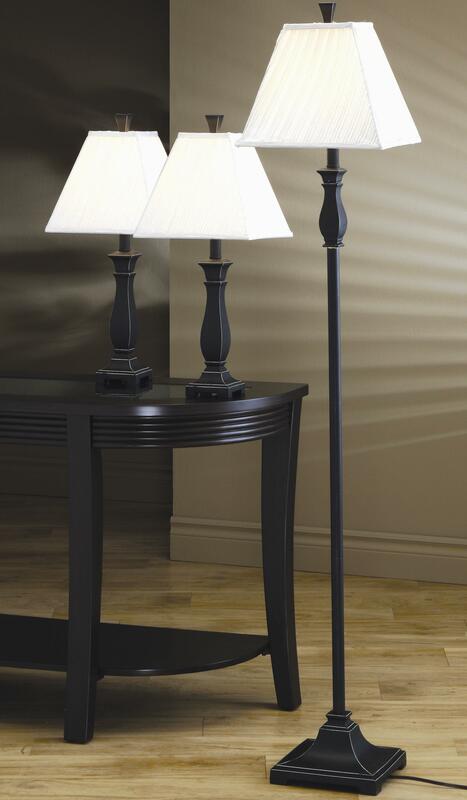 This stunning traditional lamp set includes a floor lamp and two table lamps to transform and illuminate your home. These rich lamps feature black and gold weathered finished metal bases for a classic look , with ivory fabric pleated shades for the perfect finishing touch. Add these elegant lamps to your home for a quick style update. The 3 Pack Lamp Sets Traditional 3 Piece Lamp Set by Coaster at Del Sol Furniture in the Phoenix, Glendale, Tempe, Scottsdale, Avondale, Peoria, Goodyear, Litchfield, Arizona area. Product availability may vary. Contact us for the most current availability on this product. This collection features 3 piece lamps sets to complete your living room ensemble. With may different styles and colors available, you are sure to find the perfect fit for your home. These sophisticated sets offer a quick and easy way to transform your room and update your style, while adding necessary lighting for a warm and welcoming look. The 3 Pack Lamp Sets collection is a great option if you are looking for Traditional Lighting in the Phoenix, Glendale, Tempe, Scottsdale, Avondale, Peoria, Goodyear, Litchfield, Arizona area. Browse other items in the 3 Pack Lamp Sets collection from Del Sol Furniture in the Phoenix, Glendale, Tempe, Scottsdale, Avondale, Peoria, Goodyear, Litchfield, Arizona area.